NOTE: This is the third part of a series of posts about Pandemonium. Be sure to read the first and second installments about the evolution of this amazing mixed media fusion masterpiece. Sometimes art takes on a life of itself – and that has truly been the case with my creation of Pandemonium. As I described in the first chapter of this journey, the inspiration of this project was a deep sense of needing to reconnect with my creative and experimental roots of the artist process itself. I had shared my feelings with others as a source of inspiration and to provide encouragement in getting over ‘creative blocks’ for creating more meaningful pieces of artwork. This was a heartfelt post for me, explaining my process of re-evaluating my evolution of being an artist. In a nutshell, it was if I threw my emotions and vulnerability out into the universe with no real expectations besides possibly helping fellow artists possible work through the same situation that I was currently experiencing at the time. I received an avalanche of responses from a wide range of people – from weekend crafters to seasoned professionals thanking me for what I had written! It was both encouraging and refreshing to be reminded that along this creative journey as an artist, I am not alone. What surprised me the most was receiving an email from the editor of Cloth Paper Scissors magazine in response to my post! I was (to say the least) shocked that what I felt was a bit of rambling on my part about my ‘art funk’ had struck such a chord with her with it’s honesty, and she asked if I would like to create an article for an upcoming issue of their magazine! I then spent the next three weeks re-writing my original post about Pandemonium, editing down some of the back story which led me to the process and focusing more on inspiring others. Not to mention the process of selecting and editing pictures to be featured! The biggest challenge for writing this feature story was the simple fact that at the time I was writing the article back in April, Pandemonium was still in the evolutionary phase of being completed – I had yet to solidify exactly where this project was going to lead to beyond a couple of sketches and some ideas to incorporate onto the canvas. From that perspective, the article took an entirely new meaning because in reality it was similar to both Pandemonium and life itself, always changing and full of unexpected surprises. Perhaps the most difficult part of this wonderful opportunity was that I couldn’t reveal anything until the previews and advertising for the issue were actually released by the publisher. And for those of you who know me, it’s hard for me to have to contain my excitement LOL I had also been waiting for the release of the article to share with everyone the completion of Pandemonium. And now that the Fall 2018 Issue of Cloth Paper Scissors is now available, I can finally reveal what Pandemonium evolved into! Pandemonium has been such a liberating experience for me, both on a personal and professional level. I gave myself the freedom to explore techniques without any boundaries, to make mistakes along the way and to understand that’s natural in the creative process. I shared the process with others with honesty, not worrying about any repercussions that could occur from speaking from the heart. This process was the best example of proving to myself that for creativity to thrive and flourish, rules must be abandoned and that true inspiration comes from the soul. Using this newfound courage, I decided to enter Pandemonium into a juried art competition – the first time that I have entered any of my artwork since college! I have yet to hear if Pandemonium has even been accepted, but my main goal was not to try and win the competition but to simply go through the process to hopefully see my completed artwork hanging on the wall and to be proud of what I have accomplished in creating this piece. Here you can see how a simple idea transformed into this finished piece of artwork! After the initial creation of the canvas, I had decided that I wanted to mix a more industrial look into the composition. My initial reaction to adding industrial elements is to use metal, and as my look would have it I had some metal corrugate laying around that had blown off the underside of my deck during a windstorm that was perfectly rusted and aged. I mounted the canvas onto the corrugate, and began to layer some other elements onto the metal incorporating some of the texture techniques that I had previously used on the canvas to help make the entire piece more cohesive. To cover up some of the rough edges on the side of the metal, I placed sculpted fabric around the edges and carried this over into the crevices then highlighted the shaped fabric in the same blue that I used for highlighting some of the embellishments on the canvas. The finished size of Pandemonium measures 25 by 34 inches in size and is (surprisingly!) quite light so there won’t be any issues of hanging this piece on a wall. People often ask how I describe my ‘style’ of artwork, and for many years I didn’t have a clear answer to give people except for listing off a bunch of unrelated adjectives that left everyone (including myself) confused. Over the past year, I’ve began to develop and explore my style and found that vintage industrial is the perfect description of my work. 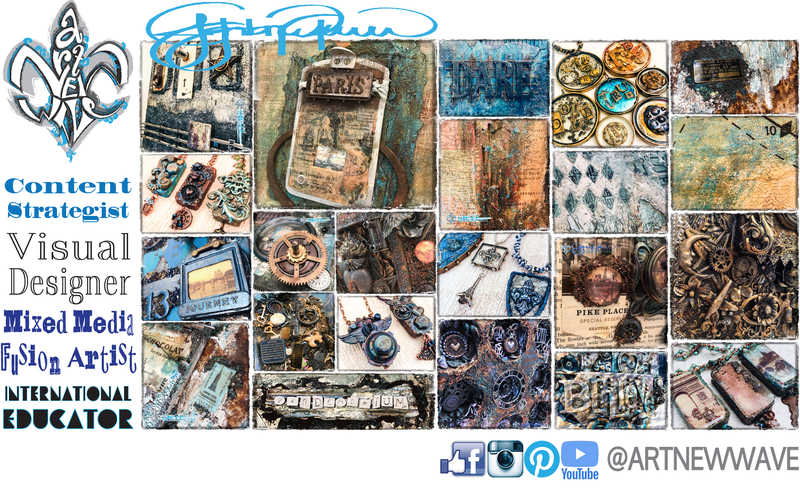 It mixes the old and the new, soft and rugged, ephemera from the past with current found objects that I upcycle. In many respects, it’s a juxtaposition of two contrasts that shouldn’t necessarily be placed together. What I loved so much about working on this project was that I had the opportunity to FINALLY incorporate many embellishments that I’d created over the years, but they never truly had a ‘home’. For example, I had created this layered open back bezel from an old washer and nut assembly years ago for an ICE Resin tutorial. It was a true labor of love, featuring seven layers of resin with mica flakes carefully placed between each layer. The focal point was a vintage lapel pin from Europe. The washer was cold enameled in ivory with pewter highlights. This piece had been sitting on my window sill over the years, and for the longest time I kept patiently waiting for the day that I could actually use it in a project. I decided that I would place it onto the upper left hand corner of the metal base layer, resting on graphite texture paste highlighted with inclusions and mica flakes. To blend the colors, I added metallic highlights and waxes to give a touch of shimmer. Another example of something finally finding it’s home was this ticket stub I had saved from my first trip to NYC back in the mid 1990’s. I’d held onto it for all of these years, hoping to someday have a project that I could use it in. While digging through my boxes of ephemera, I just happened to stumble across it by mistake and realizing that the ticket color was an almost exact match for the prominent color of the canvas, I knew that I had to somehow incorporate it into this piece! Before placing it onto the metal background, I replicated the same background texture used on the canvas and the same process for the graphite texture paste that held down the majority of the elements on the canvas. I added a light metallic color wash onto the ticket stub before adhering it onto the metal. There are a variety of other embellishments and found objects that I incorporated onto the metal background, all of them layered over texture pastes that I also used on the main canvas. I wanted there to be cohesion between the metal background and the canvas, and I decided that this was the best way to draw everything together. In some areas of the piece, I carried the texture pastes and colors from the metal up to and over the edge of the canvas. The main reason why I did this was to help soften the raw metal. Although the rusted metal was beautiful in it’s own right, I needed to soften it’s appearance just a touch because of the lighter colors used on canvas. One of my favorite embellishments that was added to this piece was this antique French door key that I friend of mine had brought back from her trip to Paris many years ago and it had been sitting in a drawer, waiting to someday be used in a project. Over the years I had debated about using this key to make into a piece of jewelry to be worn, but after some thinking I thought that instead I would let it be a piece of jewelry for this canvas! Since beading is my relaxation escape, I wove a simple peyote stitch wrap to go around the key shaft with Delica beads, topped with Swarovski crystal highlight. The key is hung from a screw that was original to the corrugate with Sari ribbon that was slightly frayed. I knew that this would be the perfect way to tie together the key plate on the left side of the canvas. As with most of my projects, I always find some way to incorporate resin into my projects and Pandemonium would be no exception! In Part 2 I shared with you how I created this layering element created from resin to be added into the project. At the time I knew that I wanted the resin piece to ‘float’ above the canvas, but I was leaving the technical aspects of adding it to the canvas until it was actually time for this to happen simply because I knew that it would take a little ingenuity to achieve the results I wanted and at the time I was having too much fun creating! After some experimenting and a few trips to the hardware store, I decided that my best option for securing the resin layering piece into place the way I wanted would be to use pop rivets. After the resin layering piece was set into place, I used 20 gauge antiqued brass wire to wrap around the tops of the rivet posts. This was for both aesthetic and practical reasons – aesthetically it gave the look that I wanted with wrapped wire, and practical because by wrapping the wire around the post tops it covered up the sharp points of the rivets to make the piece safer. By using the rivets, the resin piece is raised almost two inches off of the canvas. This was very important to me because I wanted to give the appearance of the resin ‘floating’ over the canvas while at the same time allowing light to show through from the back to illuminate the resin piece even more. And since I’d spent so much time on the color and texture of the canvas, I didn’t want to cover up any more of it than I had to! I had thought about using rivets or nails in the holes of the vintage railroad track to give it a more authentic, realistic appearance. But after creating the beaded key, I thought that using Swarovski flat back crystals over the holes would help tie together the ‘sparkle’ of the beads and crystals (which it did!). Although I’m not sure if Pandemonium will make it into the upcoming competition, I do know that the finished piece looks absolutely stunning on my mantel – which I am perfectly happy with placing there if it doesn’t end up in the show! Thank you again to everyone for your support and comments through out this artistic journey. And I can’t wait to update everyone as to continued adventures of my Pandemonium!! !